Friends of Brook Park provides fun, safe and educational experiences in our great urban outdoors. 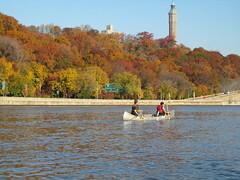 We specialise in canoeing and kayaking on the Harlem River and Bronx Kill and East Rivers, with shoreline and island views. We also venture to the Hudson River and even to the Gowanus Canal. 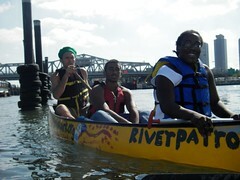 We have participated in the Fiver Boro Paddle Tour. Our South Bronx eco-tours offer an amazing recreational opportunity that opens a whole new dimension of experience. Observe natural wildlife at close quarters in an inner city environment and spark a new sense of respect and appreciation for the need to protect, preserve and restore our waterways and shoreline. We offer free public programming, check our calendar or email for more information. For a corporate adventure or team building activity with a difference, contact us to discuss the possibilities. 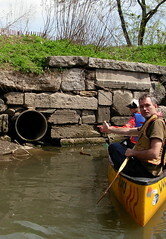 In addition, on our River Watch patrols, we monitor water quality and pollution issues on our waterways, documenting polluters and reporting to relevant agencies. Friends of Brook Park is committed to providing fun, safe and educational experiences!